Outposts are a strategic and important part of Battle Dawn. Without them one wouldn’t be able to get powerful or do much of anything. In this article I will give you a tour of how to make outposts, how to upgrade them, and what kind there are and for how much they cost. 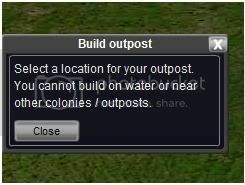 When this screen pops up your mouse now becomes a build outpost cursor. There are two different cursors: red and green. 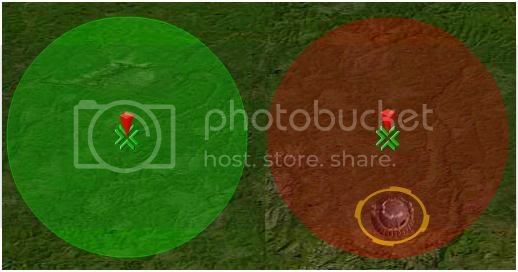 The green circle means that you can build an outpost there. While the red signifies that you are too close to another op/colony or you are in water. When you have full control ticks you can choose to raise an outpost. Razing an outpost will give you 300 metal and oil. It takes 6 ticks to fully raze an outpost. If you have squads still on (or returning/leaving) the outpost then it will turn into a camp once it is razed. You cannot attack from a camp only move from one. Settlement- use settlements to relocate your colony. For every settlement your colony’s pop cap raises 100 workers at a maximum of 1000 workers. 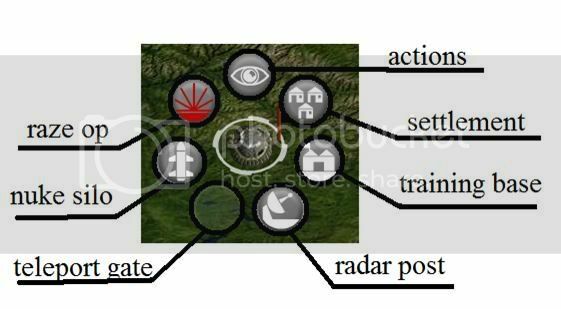 Radar Op- gives basic radar coverage to see moving squads and surrounding outposts. Teleport Gate- allows instant travel from gate/colony to gate/colony. If one of the gates/colony is jammed you cannot teleport to or from there. Training Base- enables you to recruit soldiers at distances away from your colony. *note* players may have only one Training Base at a time. Recently BD has been introduced two new special outposts, the Metal Mine and the Oil Well. This op can only be captured. When it is captured it increases metal output for your entire alliance by +5. This op can only be captured. When it is captured it increases oil output for your entire alliance by +4. Remember that these two outposts cannot be built, they are randomly placed by the Admin of the server.